Do you ever get so frustrated at work that you just want to throw all your papers in the garbage? Well, soon you could be able to flush them down the toilet — literally. 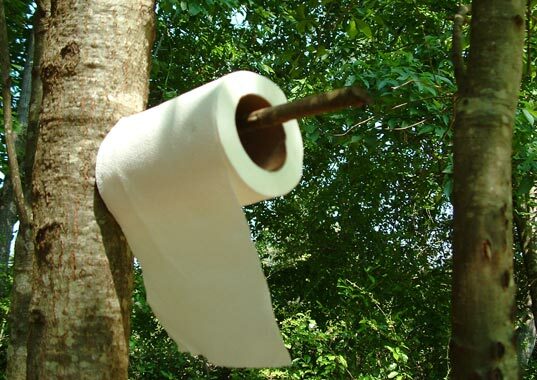 Japanese company Oriental invented a machine that recycles office paper into toilet paper right in your office. All you have to do is put paper and water in the machine and 30 minutes later, out comes a roll of TP. The machine, affectionately named the White Goat, removes any stray staples (ouch! ), shreds the paper, mixes it with water, flattens the pulp, dries it, and rolls it into bathroom tissue. It takes 40 sheets of paper to make one roll, and each roll only costs 10 cents. Seems like a no-brainer for paper recycling, doesn’t it? On the downside, the monstrous super-machine weighs 1,300 pounds, stands 6 feet tall, and costs a whopping $100,000. To pay for itself, the machine would need to produce 200,000 rolls of toilet paper, which would require it to run continuously for 11 years. While the energy consumption of the current machine model would negate all environmental benefits reaped from the recycling, it’s innovative ideas like this that have the potential to create real change. As the inventors continue to work on the machine, it will undoubtedly become smaller, more efficient, and less expensive. In the future, we could all be sending our workload right down the drain. I think everyone is missing the point here, without the environment as we know it life will not be possible. Therefore forget money it just need to be done. may you pls tell us on what are the materials(specific materials) used in making this machine? Where I can buy this machine???? If your looking for an absolutely confidential way to destroy documents this would be it! You could then factor all those shredders and special confidential disposal bins in to your cost/benefit calculations. Do you ever get so frustrated at work that you just want to throw all your papers in the garbage? Well, soon you could be able to flush them down the toilet -- literally. 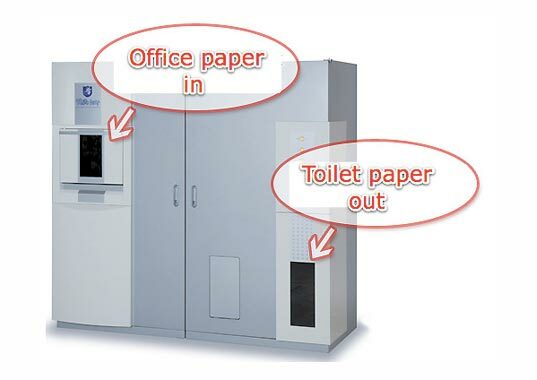 Japanese company Oriental invented a machine that recycles office paper into toilet paper right in your office. All you have to do is put paper and water in the machine and 30 minutes later, out comes a roll of TP.